Welcome! The lobby of the Deranged L.A. Crimes theater is open! Grab a bucket of popcorn, some Milk Duds and a Coke and find a seat. 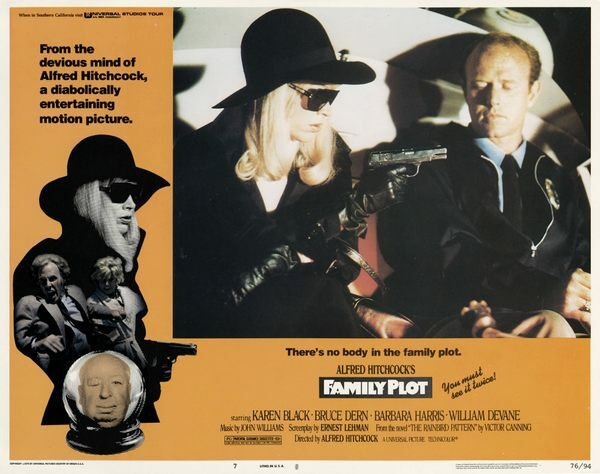 Tonight’s feature is FAMILY PLOT, directed by Alfred Hitchcock and starring Karen Black, Bruce Dern, Barbara Harris and William Devane. A phony psychic and con man are a conniving couple who plot to swindle an old lady out of her fortune by telling her they can find her long-lost nephew. In the process, their lives become intertwined with a larcenous jewel merchant and his beautiful girlfriend who have an affinity for kidnapping.